The news that a huge 40 foot wide sinkhole opening up under the National Corvette Museum has shocked many of us. After watching much of the activity and videos from the Museum yesterday via social media and webcams, we thought it appropriate to now take a closer look at those eight Corvettes which fell into the cavern under the gold skydome. 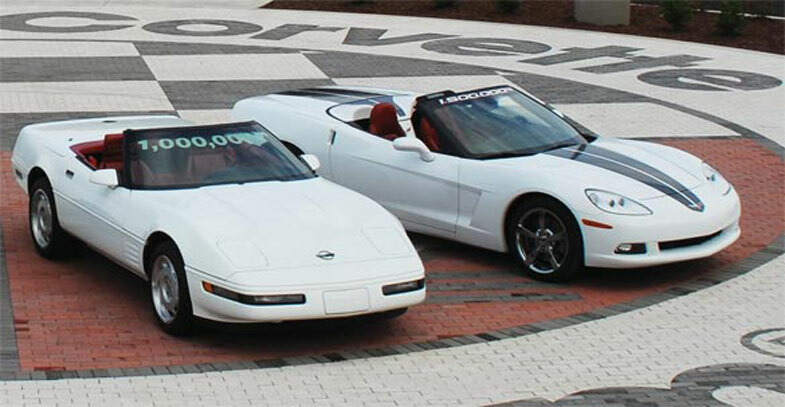 The 1,000,000th Corvette was built around 2:00 pm on July 2, 1992 at the Bowling Green Assembly Plant. Wearing the VIN 1G1YY33PXN5119134, it was similarly outfitted in a white exterior and red interior like the very first Corvette made on June 30, 1953. Options include multi-port fuel injection, 4-wheel anti-lock brakes, acceleration slip regulation, 4-wheel independent suspension and a 5-link independent rear suspension. 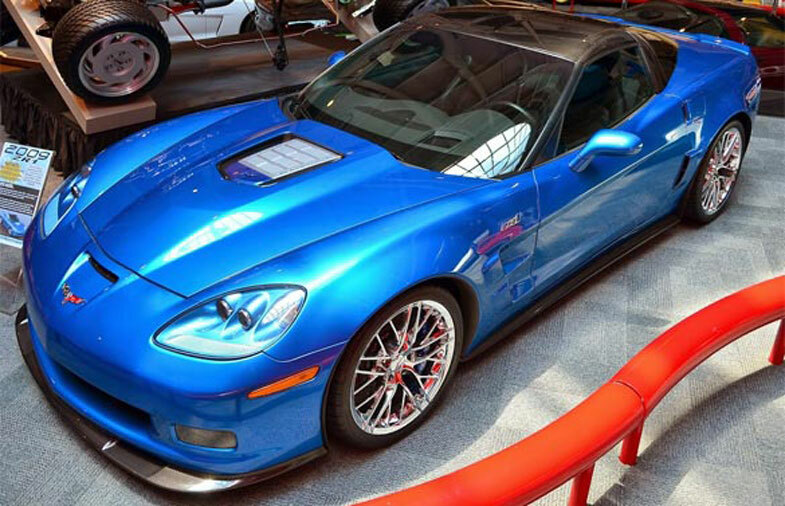 The Corvette was donated to the National Corvette Museum by General Motors. The 1,500,000th Corvette was built on May 28, 2009. It was painted white and has red leather interior like all 300 Corvettes produced in their inaugural year. This Corvette wears VIN 1G1YY36W295114471 and was purchased by the National Corvette Museum Foundation to preserve its place in history. The C6 Corvette was optioned with the Z51 performance package and the 3LT package. Other features included the forged chrome aluminum wheels, DVD navigation, Dual Mode Performance Exhaust and a paddle shift 6-speed auto transmission. This 1962 Corvette was purchased new by David Donoho and he remained the only owner until it was donated to the National Corvette Museum. David had saved his money and was still in high school when he purchased the car. David’s nickname was “The Weather Man” because his friends would tease him about how closely he would watch the weather, and how quickly he would take his Corvette home when there was a chance for rain. 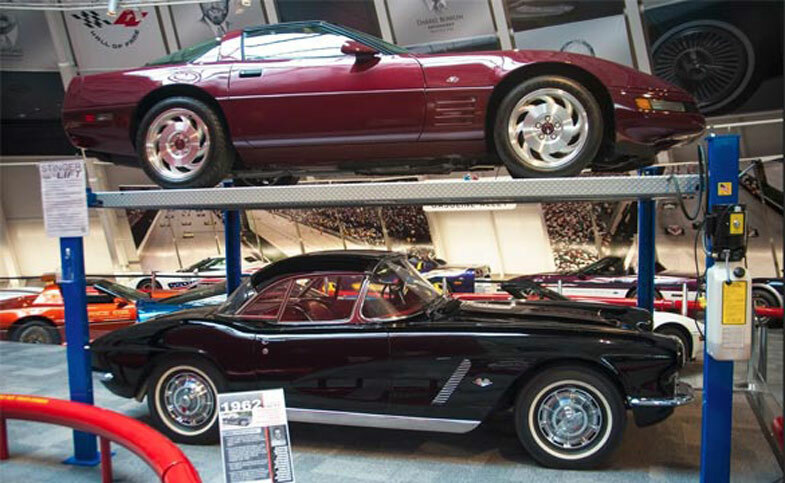 He owned four Corvettes in his life and donated this one to the Corvette Museum to ensure it would be well maintained by those who would protect it. The 1984 model year marked the beginning of the C4 Corvette generation. A bright orange Corvette Concept car developed by PPG in cooperation with Chevrolet was designed to serve as an official pace car. It was one of several pace cars which alternated in pacing some of the world’s biggest auto races including the PPG Indy Car World Series. The Corvette features a Katech engine with a chassis by George Foller. The body is by Diversified Glass Products and assembly is by Triad Service, Inc. The color of the car is Deltron paint called Orange Glow Candy. 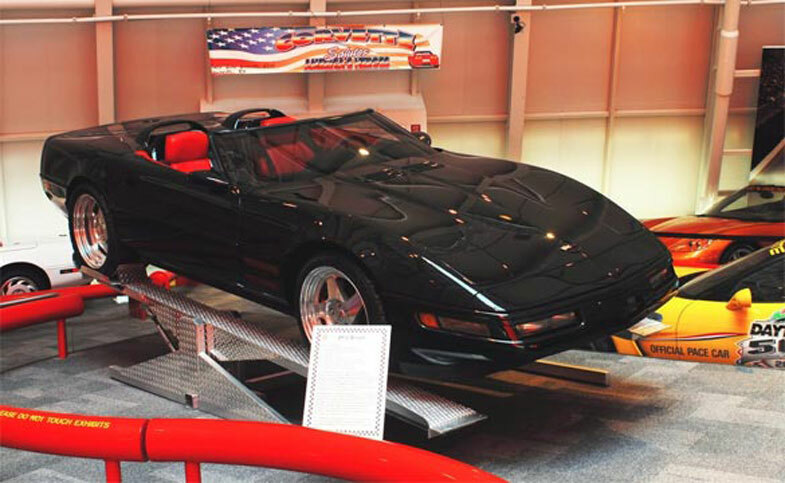 This Corvette was one of the original exhibits on display when the NCM first opened its doors on September 2, 1994. The Corvette is on permanent load by PPG Industries. This 1993 Corvette ZR-1 Sypder was one of two Corvettes on loan from General Motors which fell into the sinkhole. It made its official debut at the 1991 North American Auto Show in Detroit, MI. The car was produced at the CPC Bowling Green Plant and those who were involved in building the car have their signatures on the underside of the hood and rear deck lid. The ZR-1 Spyder features a unique hood and front quarter panel vents to aid in engine compartment cooling. A new tonneau cover flows from the rear deck lid into the passenger compartment. Individual aero bars are integrated into the bodywork behind the seat. 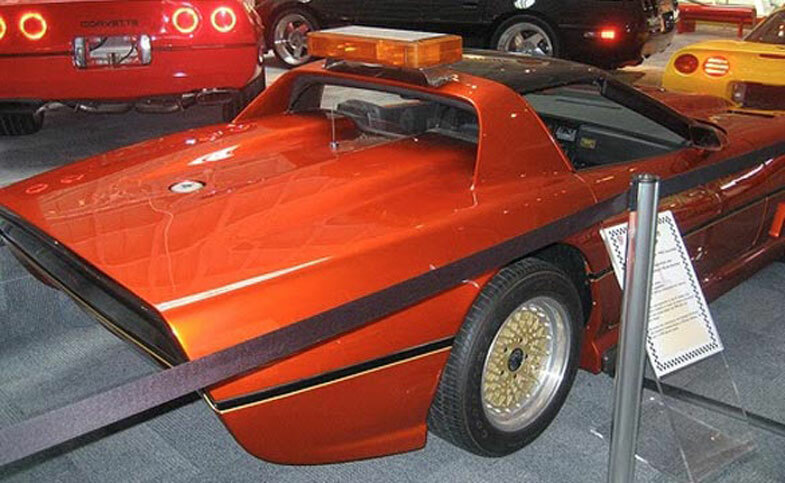 The windshield and side glass were lowered to accent the “slingshot” design. The Spyder does have a stow-away emergency top that can be attached in case of foul weather. 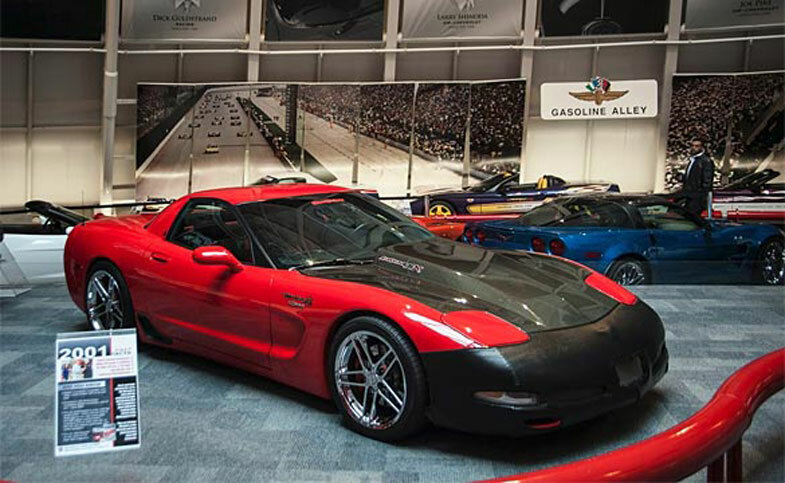 This 2001 Corvette began life as a normal Z06 but then it was sent to Mallett where it was converted from a 346/385 hp to 700 hp and 575 torque. It was clocked in the quarter mile at 10.6 seconds @ 128 mph. The car participated in a one mile top speed event where it reached 178 mph on radar and 181 mph on GPS. The Mallet Hammer Z06 has been featured on the cover of GM High Tech Magazine. The Corvette was donated to the Museum by Kevin and Linda Helmintoller of Land O’ Lakes, FL. They are lifetime members of the NCM and they donated the Mallett Z06 to help with continued growth and because they felt it would be a good vehicle for training other drivers at the new Motorsports Park. This experimental Corvette began its life as a 2008 Corvette Z06 with the VIN 1G1YY26EX850022EX. If you remember the early press photos of the Corvette ZR1, this is the car! Nicknamed the “Blue Devil”, the 2009 ZR1 is Corvette’s 200+ MPH supercar and with 638 hp, it was the most powerful automobile ever sold by General Motors. At a base MSRP of 103,000, it was also the most expensive automobile sold by GM. The ZR1 chassis is an aluminum frame derived from the Z06, but it also has Selective Magnetic Ride Control. VIN 22EX is a sister car to 23EX which ran at Nurburgring as a Z06/Z07. This Corvette was on loan from GM.